An awesome collection of sweet and savory keto and low-carb sweets recipes. They are all easy to make and super delicious! There’s nothing quite like a slice of good cheesecake. This keto strawberry cheesecake milkshake is just as good and super easy to make! Duh… Caramel makes anything sweet even better. Use this awesome keto caramel sauce to drizzle on cookies, ice cream, or anything! Combine several of the most staple keto ingredients together and what do you get? A buttery, delicious keto butter pie of course! Why not go a step further than a root beer float? Make some awesomely creamy and delicious keto root beer ice cream instead! The little mints at restaurants and parties used to be my downfall. These keto cream cheese mints are definitely better and free of sugars! It’s no secret we love carrot cake. This keto carrot cake ice cream combines the wonderful flavors of carrot cake without the carb-filled carrots! 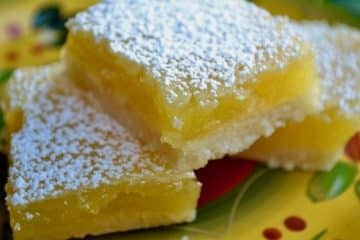 Keto lemon bars are one of our absolute favorite desserts. Make a batch of these for your next get together or keep the whole pan to yourself!